This is my last Christmas Treat recipe post for this week. the last two treat recipes for the series. I just may have saved the the best for last. 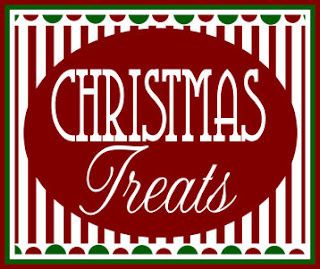 I hope you have been enjoying all of the goodies! looking at all of these tasty treats is calorie free. 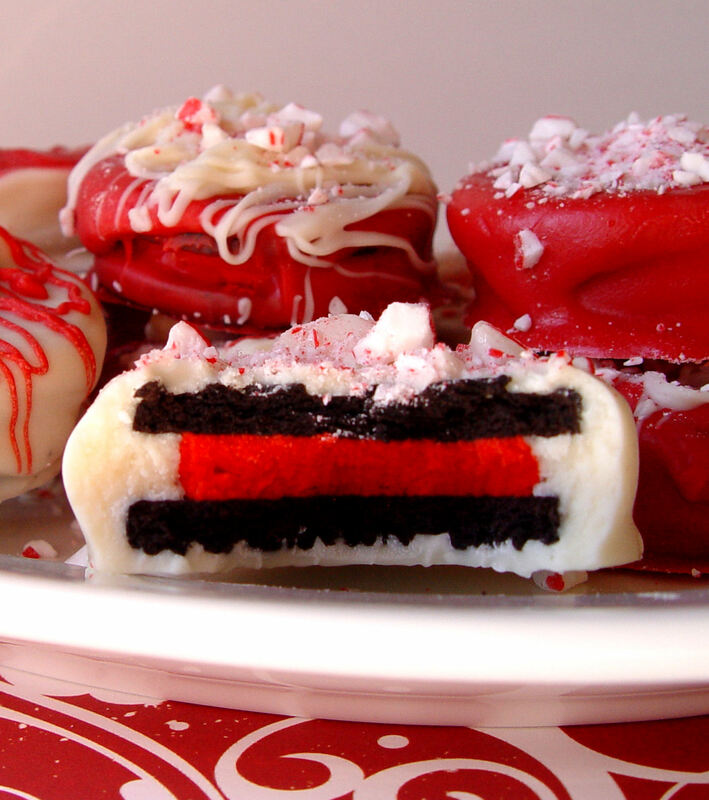 These Peppermint Dipped Oreos are very simple to make. Do not turn on your oven, no need to bake. look cute all wrapped up as a gift. Candy Melts can be found at Walmart, or any craft store. 1. 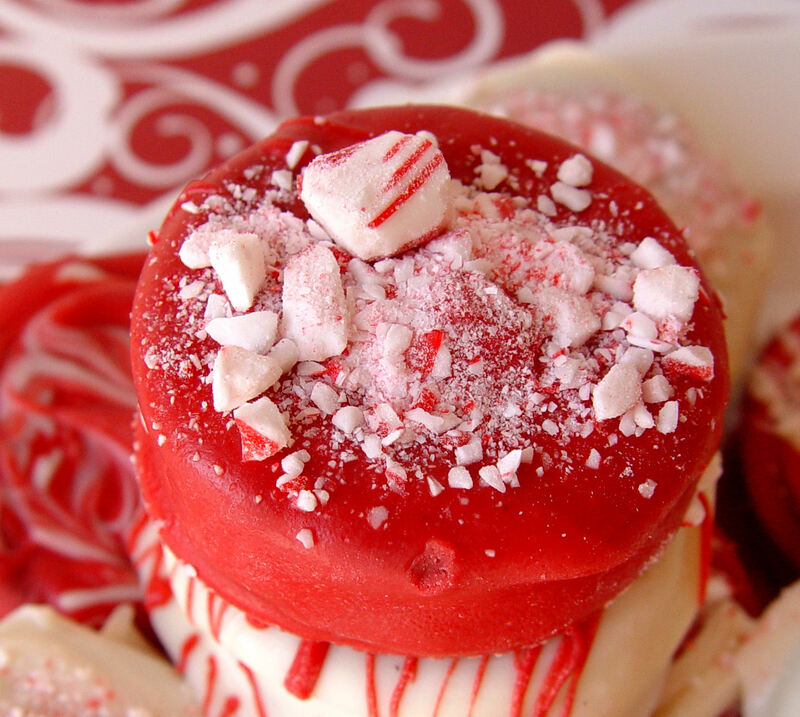 Toss some of the candy canes in a small food processor and grind them into small pieces. 2. Pour the white candy melts into a glass measuring cup. (The pint size works the best) Heat them in the microwave for 30 seconds and stir. Heat again for 30 seconds and stir. Repeat until the candy has melted and is nice and smooth. 3. Carefully place an Oreo into the melted candy. 4. Use a spoon to turn the Oreo over in the chocolate so it can get nice and coated. Using two spoons, pick the Oreo up and let the candy drip off the cookie. You don’t want to have TOO much coating. 5. Lay the covered cookie on some wax paper. Smooth the chocolate over the top with the back of a spoon. 6. Sprinkle with candy cane pieces. and swirling this lovely candy around and on top of the cookies. Because it’s kind of fun…and Christmas is about fun isn’t it? Fun and joy and merry merry ding a ling. Wow! Peppermint AND Oreos?! What can be better?! I made your Hawaiian Pineapple Chicken. Very awesome! I made these yesterday, how funny that you posted them today! Looks absolutely scrumptious!Can't wait to try them!